Upper case and intermediate housing exploded view parts drawing. Please see bottom of this page to view repair video. Electric shift Stringer 400-800 series stern-drive years 1972-1985. Press on older type years 1968-1972. Nuts, covers, oil seals, and O-rings are included in kit. See our video for a list of suggested repair tools. Instillation requires 262, 609 or 680 Loctite be installed on tapper area area and driven shaft as this is required to seal upper case. 262 Red Loctite should be placed on thread area of nut. The nut should be tighten about 90-100 foot lbs. using a 1-1/8 inch socket. Timken bearing pre loaded including seals with oil placed in them before assembly. Per-load should be 25 to 30 inch pounds with OMC the pinion shaft and ball gear assembly in place. Nut thread area should have Loctite thread lock applied, red or blue compound will work. 515 loctite gasket flange sealant or silicon can be used for covering the nut and lip of the plug. Spray a clear lacquer paint to seal the cover plug to stop it from rusting. Need help troubleshooting that are wearing out to soon. 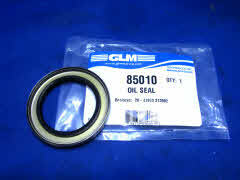 P/N 27960 bearing and oil seal retainer. #313184 $88.95 Note 680 loctite should be used on seals installed on used units please see video for details. Note Johnson / Evinrude gasket compound should be used on o ring please see video for more installation details. U-001 New upper press on ball gear 1968 to 1971 #314579 $399.15 Limited stock call for availability Note 680 retaining compound is required for installation. 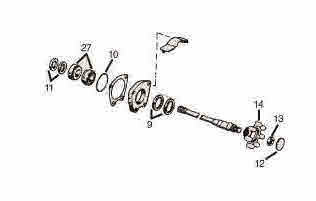 Drive shaft can be used as a direct replacement for the press on. Please note there is two sizes and bearing can be move over very easy. This makes replacement cost must lower than original type parts that also hard to obtain and no longer made. There are 2 installation videos at bottom of page or click here for 3 more ball gear kit installation videos of intermediate housing and upper.